This is a recipe that I have been making for over 20 years from a book called The Complete Step By Step Cooking Class Cookbook. I substituted the chocolate wafer crust with the Cheerios and omitted the raspberry liquor. In a food processor, add the Chocolate Cheerios and process until finely crushed. Add the melted butter until just combined. Place mixture into the bottom and up 1 inch of a 9-inch springform pan. Press firmly to make crust. Add the chocolate squares in heat-proof bowl over simmering, not boiling, water and melt until smooth, stirring often as to not burn. Remove from heat and cool. Place a medium-sized glass bowl and beaters from a hand mixer in the refrigerator (about 20 minutes) to chill. Remove, pour the cream into bowl and beat until firm peaks form. Keep refrigerated. In a small saucepan, add water and sugar. Stir. Bring to a boil over medium-high heat for 1 minute. Remove from heat and pour into glass measuring cup or mug. Place egg yolks into a large glass bowl, on top of simmering, not boiling, water. Whisk in hot syrup and continue to whisk until light and foamy. Soft peaks should form. Remove from heat and continue to whisk until cooled. Stir in the chocolate until completely incorporated. Stir in half the whipped cream until smooth. Fold in the remaining whipped cream until evenly incorporated. 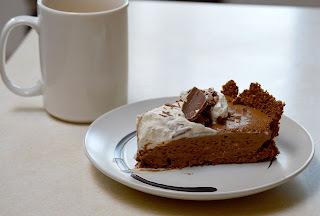 Pour mousse into pie shell and chill at least 4 hours to overnight. 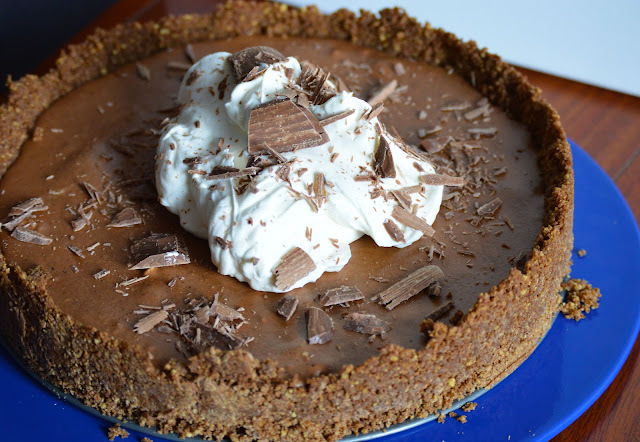 Garnish with whipped cream and chocolate shavings before serving.